Ok, I think it’s safe to say, we should start the Dak conversation. Is he a QB we should look to resign to a modest contract? Or is he a QB we should give the Kirk Cousins treatment with a Tag or 2 till we find a real QB? Riht now im on the side of neither. I don’t see it anymore. I don’t see that arm talent, I don’t see that vision, I don’t see the instincts. As I said in GB/Jock thread, I'm giving him and entire offense a bit of a mulligan. They haven't had any game time in about 3 weeks. That said, if you're not concerned about Dak, you should be. I think his confidence is shot. He looks to run a lot more than he did his rookie year. Afraid to take shots. I was all for Dak but he seems to have regressed. However it wouldnt surprise me to see him go to a different team and perform well with the right system/coaching. I believe our coaching has a lot to do with his lack of development. QB Coach Kellen Moore is no help to him at all. I’d say regression of Rush and Dak and no development out of the 3rd guy is squarely on him. I would say that is a really bad hire decision. Bingo. I mean, who in the hell puts their franchise QB in the hands of someone with no experience beyond that of carrying a clipboard. Smart =/= good coach. We've seen that with Garrett. And, why did they go away from the Romo friendly to begin with? Dak was great in it. Why not let him grow into it? The concern for Dak should be real, but once again, I don't see how this organization has helped him. Dak can only dream to make the throws Romo did down the field. Exactly. I dont think he was ever going to be like Manning or Rodgers but he could have been an above average QB and win games with the right system. 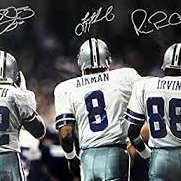 I would have loved a new coach this year to see what we have in Dak and if things could be different. I never saw the hype wth Dak, and don’t see anything in his game which suggests that he has any business in the NFL. The poor passing is just as much on Dak’s inability to make decisions and hit the broad side of a barn as it is the absurdly poor play calling and coaching. That last part is scary/disappointing/discouraging. I felt it last year, but wanted to see how Dak performs this year before making up my mind. He's not a franchise QB. He has the intangibles, but the arm talent simply is not there. He can't throw the ball downfield, anticipate his receivers running down the field and his accuracy is bad. He doesn't turn the ball over and can run, which makes him a decent backup (in a Tyrod Taylor mold), but he's not the guy. I'm so glad Dallas couldn't hand him a 100 million dollar extension this offseason.